The best way to describe Maze Runner is as “Lord of the Flies in a maze.” Like Golding’s famous novel, the film concerns a group of boys who find themselves thrust into an unpopulated, but not entirely hostile, environment. Left to their own devices, the children proceed to organize themselves into a semblance of society, with greater of lesser success. It is here that the initial similarity with Golding’s work ends. Lord of the Flies is an allegorical novel which pits nature vs nurture as it follows its civilized protagonists spiral into savagery and murder. In The Maze Runner the tension between the known and the novel is articulated differently. The children are never entirely outside of societal surveillance, and it is the nature of their relationship to the outside world that lies at the heart of the films exploration into young adulthood. The Maze Runner begins as Thomas (Dylan O’Brien) awakes in an ascending elevator. He has no memory, no idea who or where he is, or how he got there. The box delivers him to what looks like an encampment, populated by boys who appear similarly clueless about the nature of their whereabouts. Slowly, Thomas begins to know more about his new home, a community built by the boys and which they call Glade. Everyone has a job to do, and the most prestigious and dangerous one is being a Runner. Runners scout the maze which surrounds Glade, looking for a way out. While it is relatively safe during the day they have to make sure to make it back before nightfall, when deadly creatures called Grievers begin to roam. Thomas’s arrival however, upsets whatever balance there was between the boys and their environment, and things take a turn for the worst following an unscheduled arrival of the elevator carrying an unconscious girl. 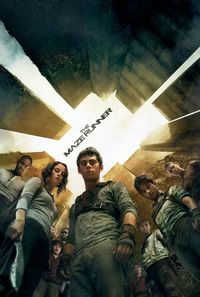 Adapted from a novel by James Dashner, Maze Runner is the first instalment in a young adult trilogy which follows the protagonist’s struggle to establish, and come to terms with, his identity. The greatest strength of the film lies in its treatment of the source material, upon which it vastly improves. It significantly deviates from Dashner’s work, thus even readers familiar with the original are in for a surprise. Falling into the popular genre of YA adaptations, it inevitably invites comparison with the most successful franchise The Hunger Games. Lacking the visual panache of Panem, Maze Runner sports a distinctly low tech aesthetic with an interesting mixture of agricultural and post-industrial which dominates costume and set design. The craftsy aesthetic which characterizes the representation of the Glade (and which gives the encampment a sense of habitation) works well in contrast with the stone-and-rusty-metal enormity of the Maze. This contrast does much to flesh out the central dichotomy of the film (and a well rehearsed dystopian trope): the choice between security and freedom. The film’s greatest problem, in my opinion, is the representation of its only female character Theresa (Kaya Scodelario). While the premise of “Lord of the Flies in a maze and with a girl” sounds like an interesting thought experiment, the film appears at a complete loss as to what to do with her, and the end result is nothing short of disastrous. I can only hope that in the sequels she will have more to do than simply provide reaction shots. Overall, the film is enjoyable but in a hollow kind of way that doesn’t necessarily leave the audience wanting for more. The performances are strong, and the story improves on the original, but unlike The Lord of the Flies and The Hunger Games (and just like Theresa) there isn’t much more than that which meets the eye. This review was published on November 15, 2014.